The Feed Reader element allows you to add a feed from another source directly onto your site. The default feed when you first add the Feed Reader element to your site is CNN.com. To add a new feed, you will need to locate the rss information from the source site. For example, a quick search on UA’s home page for “RSS Feed” provided the link you see below to receive the main events in a new feed format. Once you have copied the url for the newsfeed, simply paste it in the appropriate field. 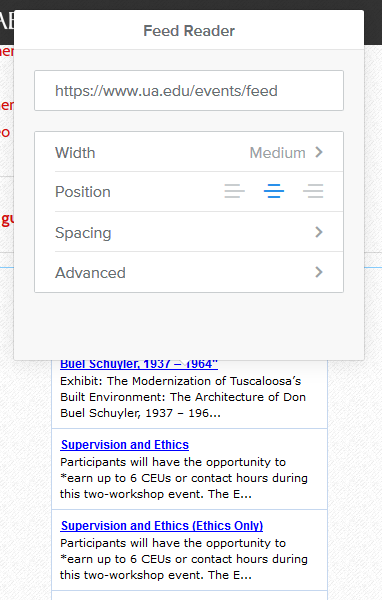 You can make other modifications such as the box width, number of items to display and length of text to display.